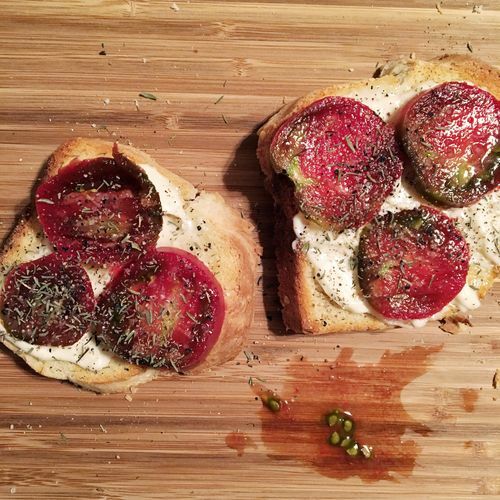 When we offered a defense of simple recipes (some might call them "recipes") a couple weeks back, we didn't take into account one particularity of those recipes in question: By many accounts, overloaded tomato sandwiches are not tomato sandwiches at all. Turns out, there's just as much—if not more—consternation involving tomato sandwiches that are needlessly complicated. The beauty, many adamantly believe, is in the minimalist maximalism. It is more because it is less. But while we respect the classic and salute the simple, we simply couldn't help ourselves. We let the tomatoes go straight to our heads! There's the don't-touch-it Southern tomato sandwich on the very left, yes, and then four others that are a little berserk. They're not competitors, though—they're disciples. They follow the same carby-creamy-tomatoey-salty formula, but they're eccentric. You probably wouldn't want to eat them standing over the sink; some might even ask that you bring out a fork and knife. I'm sure these changes/additions make some damn fine sandwiches, but it won't make a Southern tomato sandwich. Just sayin'. 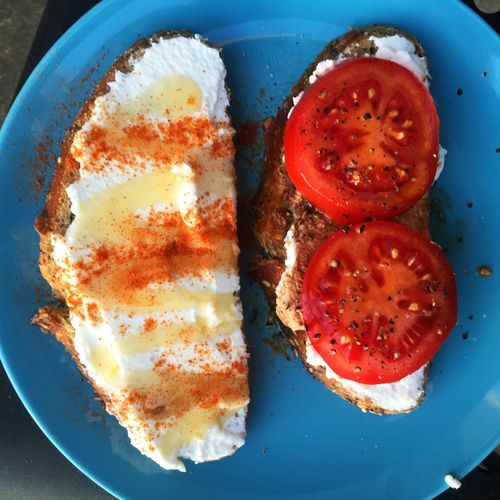 hands-down, absolute favorite way of eating a tomato in summer is served sliced on white bread with mayonnaise. No chiffonade of basil or tender leaves of oregano. No artisan sourdough bread. No extra virgin olive oil. No hand-pounded garlic aioli. No hand-harvested sea salt. No lemon zest. Not even a slice of crisp, applewood-smoked bacon. Out, out, damn spots of cracked Tellicherry pepper! it might be hard to fight the urge to add other ingredients like mustard or cheese or pickle slices, [r]esist the urge. Don't add lettuce or bacon—this is a tomato sandwich, not a BLT. [...] I'm sure these changes/additions make some damn fine sandwiches, but it won't make a Southern tomato sandwich. Just sayin'. Just feel the FOMO laid on thick in the headnote of the 5-star rated Food.com recipe: "If you've only used tomatoes as an accessory in your sandwiches, and not as the Featured Ingredient, you are truly missing summer as it was meant to be tasted." A smack straight to the stomach. Plus all the accessories listed above! We're not the only loopy ones: Ever since tomatoes cropped up at markets, we've been seeing them slapped on and between slices of bread on our (Not)Recipes app, and you're doing wacko things, too: adding dried thyme; using seedy breads, and even pumpernickel; throwing on some mozzarella cheese; swapping mayo for pesto... Quite a few of you add avocado. Caroline Lange has a low tolerance for standing by the stove in July (her kitchen, alas, is not air-conditioned). 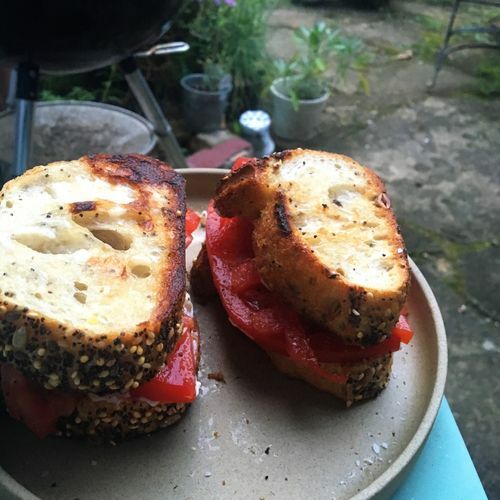 That, plus an abundance of tomatoes and a friend's homemade bread, means the best summer dinner: Good toast, Hellman's mayo, thick tomato slices, and a shower each of salt, pepper, thyme. 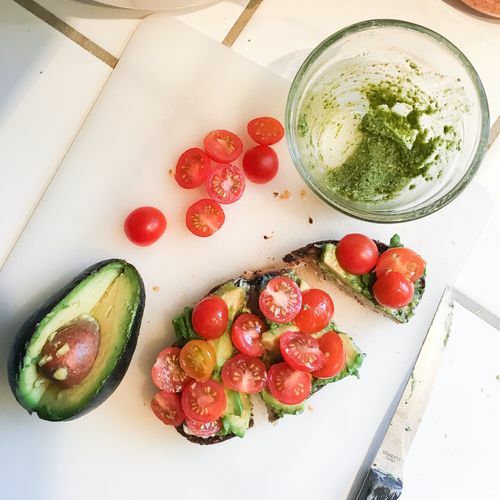 Do you smash your avocado before or after applying it to the bread? Since this bread was so fresh, we had to do pre-mashing, but that's perfect for incorporating salt, mint, and lime juice. Those tomatoes are Garden Peach heirlooms. Look like little fuzzy peaches but, once cut, reveal their tomato-y selves. Sliced tomatoes in good olive oil, salt and a roughly chopped clove of garlic. Eaten on freshly baked whole wheat sunflower and flax seed bread from the cute bakery guy at the farmers market. 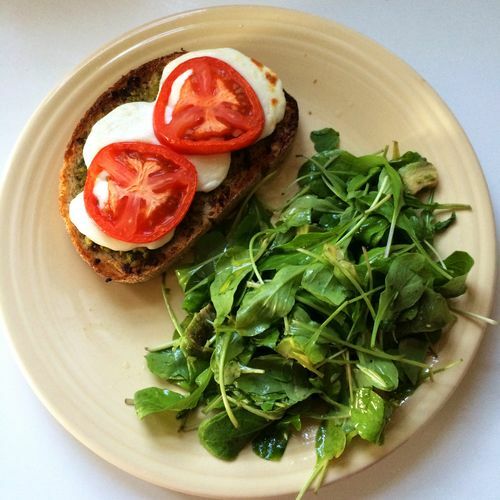 Leftover arugula pistachio pesto on thick slice of wheat bread. Fresh mozzarella and tomato, broiled. Arugula and avocado with maple Dijon lemon vinaigrette. 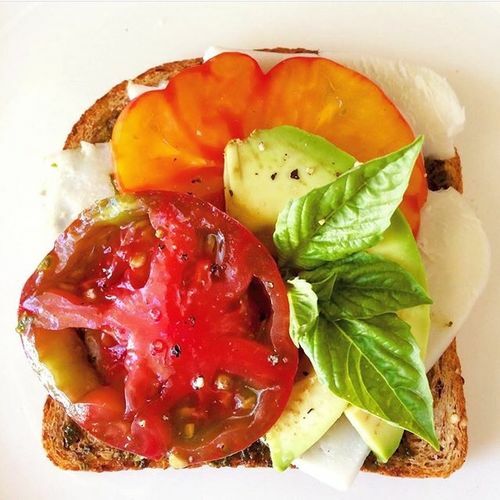 Way to hot to cook = open-faced tomato sandwiches: toasted sprouted grain bread, pesto, mozzarella, heirloom tomatoes, avocado, basil and a sprinkle of salt and pepper. Tomato sandwiches are all about proportions. Sourdough, thick tomato slices, mayo, white cheddar, white pepper, lemon salt. Summertime tomato dinners for 1 also translate into breakfast the next day. Crisp up some thick-sliced seedy bread in a pan with a little mayo on one side, let 'em go for a few minutes, and remove. Let cool slightly, and then add a little more mayo to the non-crisped side and pile on slices of fresh Jersey beefsteaks, then sprinkle on Maldon salt and a few turns of freshly-ground black pepper. Eat most for dinner but save a little for breakfast; it's just as good cold. 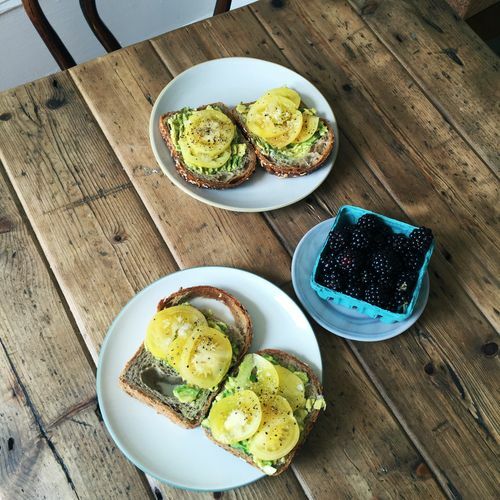 Avocado toast for dinner anyone? I slathered this with #vegan mayo (Hampton Creek Just Mayo), homemade pesto, smashed avocado and halved cherry tomatoes. Couple cranks of salt and pepper take it to the top ? 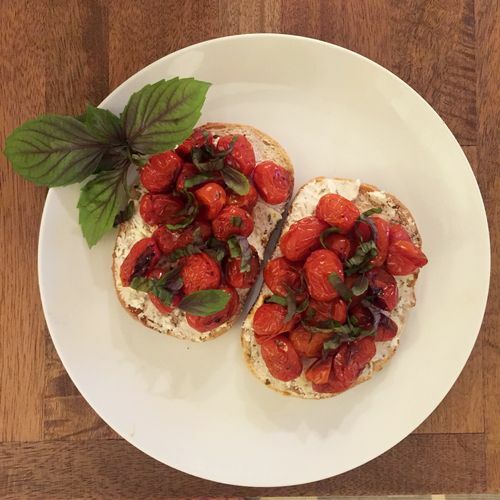 Easy and delicious weeknight dinner -- roasted tomatoes, herb goat cheese, toasted sourdough and fresh purple basil from the garden. Lightly toast thick, country bread, slather in mayo, top with heirloom tomatoes, sprinkle with flaky sea salt and pepper and call it a day. Straight summer lovin'. Ciabatta, hellman's, heirlooms, s&p, basil from my backyard. 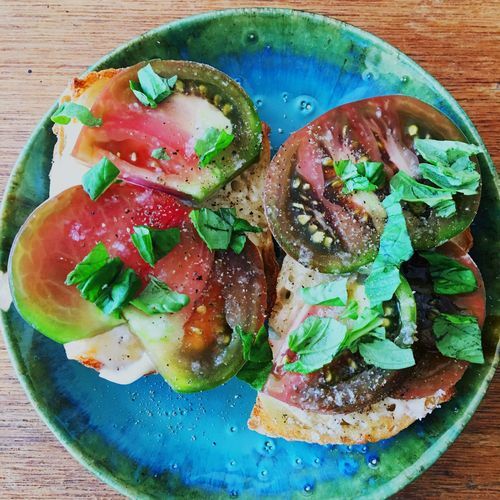 Contributing Editor Lindsay-Jean Hard's tomato sandwich is just as easy as that other tomato sandwich we were all talking about last week (link below), but there's no arguing that it's delicious. 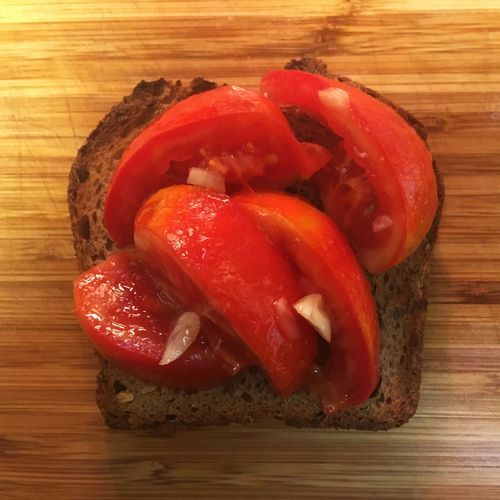 She toasted bread (pumpernickel, the same size as her tomatoes), smeared it with cream cheese, added tomato slices, and sprinkled them with flaky salt and fresh chives. Luckily, our appetite for tomatoes is such that we'll happily alternate between the super-classic and the super-creative until the changing seasons stop us. You buy a tomato with the intention of making a sandwich. What's your next move? Tell us in the comments below. This article was originally published in 2016, but we can't get enough tomato sandwiches, so we're sharing it again. Two slices of a robust bread, rye or tuscan, toasted and slathered with butter, thick tomatoes to cover the bread, then a sprinkling of salt and a pinch of sugar. As a kid hanging around my parents' store in the sixties, they would send me to the drug store next door and Eva the lunch counter lady would prepare one of these for me (well OK, the bread was your standard white industrial crap). And I've been making them ever since... it's something that I look forward to each summer. 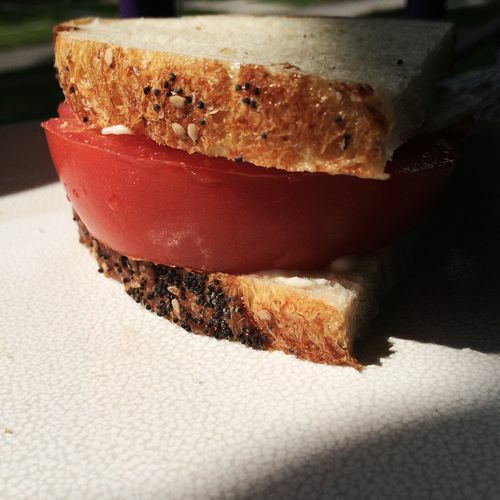 I'd never had a traditional tomato sandwich (bread + mayo + tomatoes) before this summer. And then I made Vivian Howard's take on the tomato sandwich - the smoked corn mayo alone is genius recipe worthy, together with freshly baked bread and thick slices of tomato, it was as close to heaven as I'm going to get. Lightly toasted challah, smeared with Hellmans mayo, then a layer of garlic scape pesto, then tomato slices, and finished with sprinkles of salt and pepper. According to the late, great, much lamented Guy Clark said..."There's only two things that money can't buy...and that's true love and home-grown tomatoes." Great that you revived this article! But since it first came out, we've all been exposed to Elbow-Lick Tomato Sandwich, from the Piglet and Food52 Cookbook Club choice, Deep Run Roots by Vivian Howard. 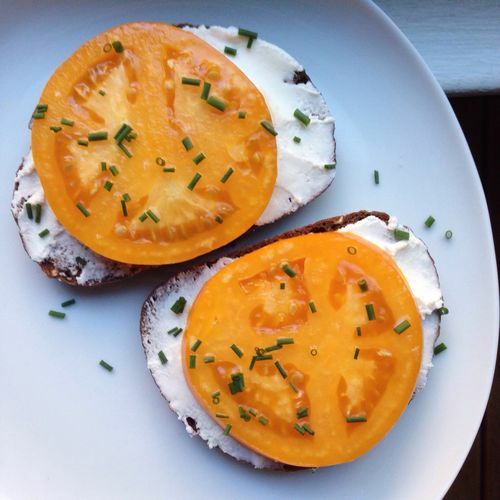 Anyone else thinking about her tomatoes on Sweet Potato Onion Bread with Smoked Corn Mayo? Ah, interesting. Fried capers? I have never heard of such a thing. I see capers in the store but I never buy them, the last time I had them I was in Holland in an Italian pizza shop -- which made real Italian pizza, complete with bald spots which, for a Californian, was blasphemy! But I like this comment, "Quite a few of you add avocado." I know about the shade cloth and did try it one year in my own pitiful attempt to have summer's best tomatoes all summer long. Failed effort. When it's sooooo hot, even the air is hot and that seems to be as much a blossom killer as direct sun. At least, that was my experience. From 12 tomato plants of several varieties, I got ONE purple heirloom tomato. Oh boy! Did I treasure that. Ate it on the spot. No washing, no salt, just purple tomato! Did you grow any this year? I fo mine in pots on the patio and they are loaded this year. Used Epson salt in the soil before planting. Not sure it helped but I can honestly say these are juicy and delicious this year. Gorgeous photos. And every sandwich incarnation looks delicious. Unfortunately, here in South Central Texas, our tomatoes are almost done, since the temps. are upward of 90+ degrees. I'm trying some hydroponic ones raised nearby and hoping to get the luscious flavor of the huge beefsteaks I had earlier in the summer. When I can't get local, I try to find Texas grown Camparis, which to my taste are the only commercial tomato worth the name. But again, nothing like locally grown, from a neighbor's garden or the farmer's market! You can buy shade cloth from a nursery that blocks the amount of sun you want Cloth from 10-50% reduction is available, I think, and it lowers the temperature enough degrees to avoid the high heat from killing the blossoms. I'm not from the South but we grow plenty of tomatoes in the North too. Toasted bread of your preference. Each slice gets mayo and don't be stingy with it. Inside just slices of tomato with a sprinkle of salt. That first pic with the article has it right. Though that's a sloppy mayo job. It's got to cover the whole piece of toast. If you're gonna do it, then do it right. Many of these variations sound delicious, and I'd be willing to try them all. That said, during the height of tomato season, I don't believe in featuring them any way other than front and center--which means a tomato sandwich on white bread with mayo and salt, a simple salad with olive oil, salt and pepper, or perhaps an uncooked sauce with garlic, basil, and olive oil over pasta. Anything more complex (or cooked) should be saved for the off-season. Just my opinion. The Tomato Gospel According To Susanna. Thank you! PS: My opinion is the same as yours! Nothing better than one small area of the world snarkily proclaiming ownership and judgment over a centuries-long international practice. Pretty sure that's how specific cuisines get started. By demanding one way and not being open to change? Quite the opposite. Throughout history, we can see how peoples' food practices and cultural habits changed as their insular practices (based on access, wealth, and climate) were introduced to different worlds through invasion or exploration. The Peruvian potato that became a staple in Ireland and Europe, Brits discovering tea, distillation introduced to Roman world from Islamic tradition, the introduction of spices, how Crete food was influenced by numerous invaders, and on and on and on. New practices became defining cultural elements by being open to other traditions, or appropriating for their own. Amen to Renee Joslyn's Comment - No. Born and raised in the Deep South, in a family where summer tomatoes are close to a religious experience. We eat them out of hand, like apples, as often as not. But nothing replaces the Kitchen Sink tomato sandwich - white bread, Duke's mayo, and thick slices of ripe tomato (maybe a pinch of salt). Stand over the sink to eat it, while the juice runs down to your elbows. That said, all these alternatives look delicious - but they AREN'T tomato sandwiches. These may all be lovely sandwiches, but they are NOT tomato sandwiches. Soft white bread, Duke's mayo (Hellman's if you can't find Duke's), thick slice(s) of fresh tomato. Period. 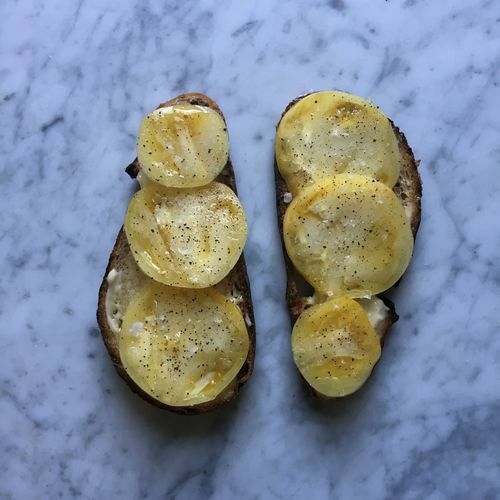 Change the bread, toast it, or add another or different ingredient, and it becomes something else. You want avocado toast? call it avocado toast. Now, quit screwing around - you've got better things to do than try to convince us that any of those other sandwiches are Tomato Sandwiches. Cantaloupe! My phone is always changing my spelling. I only wish I had photographed lunch. Even before I saw this I took some herbed naan and layered it with tiny heirloom tomatoes and some spicy peppercorn cheese from a farmer at my local market, broiled it and tired it with a fried egg. I had some juicy candle as a side. Yum! Next move: send husband out to buy FRESH mozzarella from a shop where it's made in the back. If we're lucky it might still be warm. Also get some Kalamata olives. Cut up, they add wonderful little bursts of flavor with the tomatoes and mozzarella. The best is plain white bread, mayo and a huge beefsteak tomato. The original is the best but all of these recipes look great. My latest is the Ezekiel grain bread, a couple slices of tomato and avocado. Oh, and do not forget the mayo. I live in Florida so we have tomato's all year round. I probably can speak for everyone here, tomato sandwiches evoke memories of our childhood. My mom always made either grilled cheese or tomato sandwiches with tomato soup. She put onions in the soup and swirled cheese in until it melted. This was a recipe of my grandmother's and was called "Ring Dum Ditty". Don't ask me what that means but it was wonderful. Props for making another simple tomato sandwich post after the ridiculous ire of the last one. And great timing as I just sat down with a tomato + bread lunch.